The thick layers of penguin guano and nest debris that have stacked up over millennia in Antarctica are adding to the climate picture, indicating that the Ross Ice Shelf began advancing earlier than previously thought. Photograph is by Steven Emslie. Ice cores and microfossils, step aside: Penguins are now helping researchers nail down the timing of Antarctica’s last advance of the Ross Ice Shelf. Previous geological data from marine sediments in Antarctica have suggested that the last advance of the Ross Ice Shelf into the Ross Sea, during the last glacial maximum, began by 24,000 years ago. Evidence from the region’s Adélie penguins, however, points to an earlier advance starting 27,000 years ago, according to Steven Emslie, a paleontologist at the University of North Carolina at Wilmington. 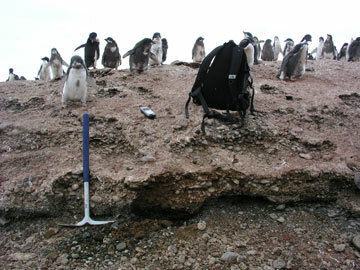 The finding stems from Emslie and colleagues’ analysis of 62 vacated Adélie penguin nesting sites, as reported in the January Geology. Adélie penguins return to the same nesting sites each year, sometimes for thousands of years, building up layers of guano and other debris that is preserved by the region’s frigid environment. By dating the layers in the sediments, Emslie’s team determined when the penguins were present, and therefore determined the site’s environmental conditions at that time, as Adélie penguins nest only in environments free from ice and close to open water. The presence of Adélie penguins up to 45,000 years ago suggests that there was “definitely” open water in the Ross Sea at that time, Emslie says. Likewise, the absence of penguins 27,000 years ago suggests that the advancing ice shelf closed off the Ross Sea to the penguins until it began retreating 13,000 years ago to its present position.